Volume 1: 50, 88 pp., entries dated 17 December 1861 to 4 August 1862; lacks binding, dis-bound, several leaves and signatures loose, with edge wear and minor toning; there are 50 pages of diary entries, the rear 88 pages in the rear concern Nevin's work as an orderly sergeant containing list of soldiers, schedules, a sick list, those on fatigue duty, lists of who is on general guard duty, equipment returned to Quarter Master, list of those on third relief, and a long running tabulation of those discharged, absent, etc. ; one list mentions the men at Benton Barracks in 1861. Front page has the following inscription: "Diary of F.E. Nevins, Centralia Mo Dec 17th 1861." Volume 2: 85, 3 pp., dated 26 August 1862 to 13 May 1863; bound in full limp calf, minor wear, some rubbing and small tear to rear board; there are 85 pages of diary entries, the final 3 pages consist of a "Letter Register," showing to whom and when he wrote, or letters received. Front flyleaf is inscribed: "Private Journal Frank E. Nevins, Orderly Sergeant Co. A, Western Sharp Shooters, 14th Missouri Vols. In Camp at Corinth, Miss. Aug 26th 1862." 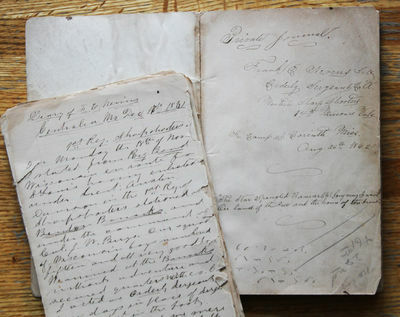 A pair of compelling Civil War diaries from the early years of the war, kept by Frank E. Nevins, orderly sergeant of the "Western Sharpshooters." Nevins spent late-1861 and early-1862 on the western side of the Mississippi River. The diaries contain detailed descriptions of camp life, troop and officer movements, skirmishes (such as his brief recounting of his unit's involvement in the Battle of Fort Donelson), his musings on life and death, and also contain multi- page accounts of both the Battle of Mount Zion Church and the Battle of Corinth. He also celebrates two birthdays during the time covered in these journals. Nevins served under Colonel John Ward Birge, a St. Louis eye doctor who was appointed by General John C. Fremont to head a specialized unit of marksmen intended to be a western counterpoint to Berdan's Sharpshooters. The Western Sharpshooters were organized just a month before Nevins entered service. The unit left Benton Barracks in St. Louis on Dec. 12, 1861, headed for Centralia to fight bands of Confederate guerillas attacking the vital North Missouri Rail Road. The diaries begin with the action just five days later. The first diary opens with an account of Nevins in a snowy, wintery camp at Centralia, Mo. He recounts an incident where his unit was searching for a "secesh" spy. Once they located the spy inside a house, they surrounded the building and "the firing of revolvers was kept up for some time." The group fights patches of Confederate troublemakers for several days, finding themselves about fifteen miles south of "a town called Rennick [Renick] on the N.M.R.R." on Christmas Day, where Nevins' unit enjoys a "bright and beautiful day" and "pass the morning in thinking of home and its dear ones." A couple of days later, the unit proceeds to Sturgeon, Mo. where they link up with other units under Brigadier General Benjamin Prentiss, the commanding officer during the Battle of Mount Zion Church on December 28. Nevins' entry for January 1, 1862 recounts his participation in that critical battle, an important Union victory that resulted in the end of Confederate recruiting in Missouri for over two years. Not long after the Battle of Mount Zion Church, and after moving somewhat east, in early March 1862 Nevins records a few details about his unit's involvement in the Battle of Fort Donelson in Tennessee in mid-February. "I truly and confidently expect this naughty rebellion will be completely played out in the next six months, and I have an opportunity to eat a Christmas turkey at home. We soldiers are anxiously watching the progress of events before Richmond. We expect the most successful issue." Most of the time while in Corinth, Nevins and his unit lead "a secure, quiet, unprofitable life." On October 2, Nevins writes that "there is some expectation of another battle in this vicinity before long." By the next day, Nevins and his unit are involved in the Battle of Corinth, which Nevins writes about over the course of the next six pages. Nevins describes the battlefield of Corinth as a "scene of carnage and death." He reports that his regiment was ordered for picket duty until they were "deployed as skirmishers in order to fell the enemy." Nevins and the 14th Missouri Sharpshooters served the next several months in Corinth or Rienzi, Mississippi (a location Nevins mentions several times), helping to establish Camp Davies, just south of Corinth. After the Battle of Corinth, the Western Sharpshooters were part of an effort to stabilize Mississippi for the Union Army, and Camp Davies was part of that strategy. By Christmas Day, 1862, Nevins is stationed at Camp Davies, "seven miles south of Corinth and about a mile west of the Mobile and Ohio Railroad." Nevins describes Camp Davies as "of sufficient elevation to command the surrounding country with artillery for a considerable distance...." On December 28, Nevins mentions the anniversary of the Battle of Mount Zion Church, in which his regiment served just a year earlier. The next action Nevins sees occurs in Danville, near Rienzi, Ms. On February 8. The skirmish was mild. On March 26, Nevins notes that an officer who had been a rebel prisoner since Murfreesboro arrived at Camp Davies that day from Atlanta, "having traveled nearly five hundred miles through the enemys country to make his escape." On April 2, Nevins gives a brief account of the skirmish of his regiment at Booneville. A little less than two weeks later, Nevins reports on the skirmish at Glendale, near the Memphis & Ohio Railroad. And Nevins' final entry mentions a small incident his regiment encountered at Jumpertown, where his group was "fired upon by the guerillas but a charge sent them flying." In addition to Nevin's diary entries, there are numerous pages listing soldiers, equipment, schedules, a "sick list", "Guard Duty," a letter register, and other lists, presumably from Nevins' work as orderly sergeant. A truly captivating pair of journals from a Union sharpshooter, serving in areas of the south and west in the first two years of the Civil War. Nevins was at many locations while he kept these diaries during his military service, including: Centralia, MO; Sturgeon, MO; Fort Donelson, TN; Schofield Barracks, MO; Corinth, MS; Camp Davies, MS; and Danville, MS; etc. The 66th Illinois Veteran Volunteer Infantry Regiment (Western Sharpshooters), originally known as Birge's Western Sharpshooters and later as the "Western Sharpshooters-14th Missouri Volunteers", was a specialized regiment of infantry sharpshooters that served in the Union Army during the American Civil War. The regiment was intended, raised, and mustered into Federal service as the Western Theater counterpart to the Army of the Potomac's 1st and 2nd United States Volunteer Sharpshooters ("Berdan's Sharpshooters"). Birge's Western Sharpshooters" was a multi-state, Federal unit organized at St. Louis, Missouri and mustered into federal service on November 23, 1861. Initially two companies were raised in Ohio, three in Illinois, one in Michigan, and four were organized at St Louis' Benton Barracks of Missourians and detachments of volunteer candidates sent by recruiting officers from Iowa, Minnesota and other western states, thus forming a regiment that represented every state in the west, a pet scheme of General John C. Fremont. On August 28, 1861, Fremont authorized a St. Louis physician, John Ward Birge, to raise the regiment and muster recruits at Benton Barracks, St. Louis. On December 12, 1861, Colonel John W. Birge, of St. Louis, marched them from Benton Barracks to Centralia, in Northern Missouri. The regiment was then deployed in small detachments to fight bands of the secessionist Missouri State Guard and guerrillas attacking the strategically vital North Missouri Rail Road and other targets of interest to the Federal government. On December 28, 1861, five companies of Birge's Sharpshooters and five companies of cavalry fought a mixed force of Missouri State Guard and secessionist volunteers at the small, but strategically important Battle of Mount Zion Church. On February 4, 1862, the sharpshooters were first shipped by railroad to St. Louis and then by steamboat to Fort Henry, where they eventually arrived on the 9th, just too late to take part in its capture. (Note: As they passed through St. Louis, Maj. Gen. Halleck ordered Company A (Welker's Company) stripped out of the regiment and reassigned to the newly forming 26th Missouri Volunteer Infantry Regiment, temporarily reducing the regiment to nine companies. At Fort Henry, the Sharpshooters joined Colonel Lauman's brigade of General C.F. Smith's division and marched with them to Fort Donelson. In Grant's army they served at the Battle of Fort Donelson and the Battle of Shiloh. On April 14, 1862, acting commander Lt Col B.S. Compton received a letter informing him that on the order of Major General Henry Halleck, Commander of the Department of Missouri, the regiment had been re-designated the "Western Sharpshooters-14th Missouri Volunteers". The re-designated WSS-14th MO Vols, participated in General Halleck's long advance on the Confederate rail center at Corinth, Mississippi, skirmishing ahead of the main force almost every day. On May 30, 1862 Confederate General P.G.T. Beauregard evacuated the city without a fight. The Sharpshooters were then stationed in the Corinth area. On July 8, 1862, the regiment's new commander Colonel Patrick E. Burke arrived. A veteran militia officer, he had been awarded a Regular Army Captain's commission following service in the old 1st Missouri Volunteers in General Lyon's Missouri campaigns (including participation in the stand at Bloody Hill at Wilson's Creek). Colonel Burke used the period at Corinth to integrate new recruits from Camp Butler and unify the regiment as a military organization. In mid-September 1862, in response to the offensive by Confederate Generals Earl Van Dorn and Sterling Price, a three-company battalion of the Sharpshooters marched south with Major General Rosecrans' army towards Iuka, Mississippi. This detachment participated in the September 19th battle. They then returned to Corinth, where the entire regiment fought on both days of the October 3rd-4th (2nd) Battle of Corinth. On October 4th, as per General Rosecrans' orders, the regiment fought as skirmishers in the timber in front of the Federal fortifications (to the right of a three-company battalion of the 64th Illinois "Yates' Sharpshooters"). They skirmished under the direct command of Colonel Burke from 4 a.m. to around 10 a.m., when they began to fall back on the main Federal line. When the Federal center collapsed, the regiment fell back again towards the town and Battery Robinette, where they continued to fight until the Confederate breach was contained. After the Second Battle of Corinth, the regiment helped establish Camp Davies, a tockade outpost six miles south of Corinth. In December, 1862 (after the strong intervention of Governor Yates of Illinois) the Sharpshooters were transferred to Illinois service as the 66th Illinois Volunteer Infantry (Western Sharpshooters) on November 20, 1862. (The regiment was allowed to maintain the Western Sharpshooters as part of its official designation following a request by letter to Governor Yates from Colonel Burke.) Beginning in the autumn of 1863 the men of the regiment began equipping themselves with the new 16 shot Henry Repeating Rifle, giving them a major advantage in firepower over their Confederate opponents. Over 250 of the sharpshooters spent an average of 40 dollars out of pocket (over three months pay for a Private) to arm themselves with this highly effective new weapon. The government, while it did not purchase the weapons, did provide Henry rifle cartridges for companies whose soldiers had done so. The diaries end in May of 1863, but the regiment remained at Camp Davies until November 12, 1863, when 2nd Division, XVI Corps moved to Pulaski, Tennessee, where they established "Camp P.E. Burke". During December 1863, 470 men of the regiment re-enlisted and in January, 1864, were sent to Chicago to be given veteran furlough. After being re-organized as a veteran regiment of 600 men, they returned to Pulaski, until April 29, when they left for Chattanooga to join in the Atlanta Campaign. Frank E. Nevins was born 7 February 1839 in Versailles, New York. He enlisted into military service on 4 November 1861 at Vernon, Wisconsin, and mustered in a month later on 5 December 1861 for three years' service at Benton Barracks, Missouri. His military unit was originally called the 66th Illinois Infantry, but later became known as the Western Sharpshooters 14th Missouri. He was discharged on 7 March 1864 at Peoria, Illinois. During his time in the military he was promoted to orderly sergeant. After his service with the Western Sharpshooters, Nevins became an officer for the 61st U.S.C. Infantry. He was commissioned an officer in Company S, U.S. Colored Troops 61st Infantry Regiment on 8 March 1864, the day after he was discharged from the Western Sharpshooters, and promoted to a full 1st Lieutenant on the same day. He mustered out from the U.S. Colored Troops 61st Infantry on 30 December 1865. The 61st was originally organized in June of 1863 at LaGrange, Tennessee, the hometown of Nevins' future wife Augusta C. McCrellis. The regiment was reorganized when Nevins came aboard in March 1864. The 61st was part of Major-General A. J. Smith's Expedition to Tupelo, Mississippi July 5-21, 1864. On July 13, as part of the rearguard of Smith's column they were involved in an engagement known as Camargo's Cross Roads (or Burrow's Shop to Confederates). The next day at Harrisburg, near Tupelo, Mississippi, the regiment participated in the Union victory over Confederate forces under Major-General Nathan Bedford Forrest at the Battle of Tupelo. In this campaign the 61st lost one officer and seven enlisted men killed, with four officers and 28 enlisted men wounded and 16 enlisted men missing. Most of the regiment participated in Smith's expedition to Oxford, Mississippi, August 1–30, 1864, and the regiment saw action at Waterford, Mississippi August 16–17, 1864 and at Castpool. A detachment of five officers and 200 enlisted men under Captain Charles Riggs, which had stayed behind during the Oxford expedition, was camped near Memphis and surprised and overrun by Forrest's troops at the Second Battle of Memphis on August 21, 1864, losing three men killed, eight wounded, and five missing. The regiment was ordered to New Orleans, Louisiana, February 23, 1865 and then to Morganza, Louisiana. On March 17 they were sent to Fort Barrancas, near Pensacola, Florida, and from there were ordered to Blakely, Alabama on April 15, where they finished out their service. The regiment was mustered out on December 30, 1865. The regimental losses during service totaled 356: 1 Officer and 37 enlisted men killed and mortally wounded and 2 Officers and 316 enlisted men by disease. After the war Nevins married Augusta C. McCrellis in 1877 at Niles, Michigan. At the time of his marriage Nevins was listed as a reporter and was living at Indianapolis, IN, and his wife at Lagrange, Tennessee, where she was born in 1845. They lived in St. Louis, Missouri from at least 1900 till 1914, when Nevins died at St. Louis on 7 Aug 1914 and was buried at Bellefontaine Cemetery. In 1900, Nevins was listed as a short hand reporter. At the time of his death Nevins worked as a clerk in a post office in St. Louis. The couple had at least one child, a son Beverly M. Nevins, who was listed as being born in New York in 1880. On Monday the 18th of Nov I started from Big Ben, Wisconsin in route to St. Louis having enlisted under Lieut. Austen Davison in the 1st Reg. of Sharpshooters stationed at Benton Barracks and under the command of Col. J.W. Birge. Our squad of Wisconsin boys numbered fifteen and all very good boys. We arrived at the Barracks without adventure and secured quarters with Co. C. I acted as orderly sergeant a few days in place of Sergeant Bettice, shot in the foot. Shortly afterward we were united with Co. B. Capt. Boyd and I took my place in the ranks very willingly. Camp life in the barracks was tedious and uniform and when on Thursday 12th of Dec we received orders on dress parade to report ourselves at the North Mississippi R.R. Depot at eight o'clock, the delight of the boys was irresistible and their pleasure broke forth in repeated shouts. Preparation was instantly made and many of the boys roistered about the quarters during the entire night. At about nine o'clock on the 12th we reported ourselves at the depot according to orders and embarked at twelve after considerable delay and anxiety. Our destination remained a curious secret. We however restrained our curiosity. The crossing of the Missouri river at St. Charles was attended with considerable delay and hustle. At twelve o'clock we were again underway and in the afternoon of the following day moved to Centralia having experienced no very exciting adventure or hardship. Here our experiences as soldiers commenced…"
Since I last took up my pen to write many things have taken place of importance. On the 28th of Dec. four companies of Sharpshooters under the command of Col. J.W. Birge and five companies of Col. [Glover's] cavalry having received information of a camp of rebels started at two o'clock A.M. the division being under the command of Brig Gen. Prentiss, for the purpose of dispersing them. We came up on about 200 of their pickets at about ten o'clock in the morning of that day when a sharp skirmish ensured. The rebels made every effort to escape some five or six were shot dead by the 'Fed's,' several wounded severely, and some ten or twelve prisoners were taken. Their encampment proved to be some two miles from where this engagement occurred. Two companies of cavalry and two of footmen were immediately dispatched to engage the enemy. Before the arrival of the riflemen a charge was made upon the rebels by Major [Kansack] with about 25 men. This rash charge was repelled with the loss of some five or six taken prisoner. Corp. Boyd's command soon arrived upon the scene of action and was ordered to renew the battle. Capt. L.B. Cutlar's company also come up. The balance of Col. Birge's command being held in reserve. The fight now commenced in earnest. The fire on both sides was terrific and the balls of the enemy fell like hale around our brave boys. Many were wounded, and three of the cavalry were killed. After a hard fight of about thirty minutes the enemy began their retreat. Our men followed and did all the execution in their power. Two of the sharpshooters were mortally and some fifty more were slightly wounded. The enemy were severely punished and fled. We killed, as nearly as could be ascertained, some fifteen or twenty of the enemy, wounded about one hundred more, took 27 prisoners, 100 guns, and sixty horses and mules. The enemy's camp was situated upon a hill, difficult to approach, and surrounded by woods and brush, which the enemy took advantage of to the utmost extent. The fights occurred about 18 miles from Sturgeon, the place of our encampment, and after the battle we performed the pedestrian feat of marching back. We arrived back about ten o'clock, feet sore and weary, with scarcely strength to masticate our scant supper. Thus ended the fight of the 28th, which will long be remembered by those engaged in it as a warm and bloody one…"
A long interval has occurred since I wrote in my book and many important and interesting events have transpired. On the 4th of Feb. We started from Sturgeon, Mo for the seat of war by the way of St. Louis. We received our pay on the day previous to this event and were consequently in good spirits. The evening of the 4th was spent on the cars at St. Charles by our regiment. I was on guard. The night was very cold. And unpleasant in the extreme. The following morning, we were transported across the river not however until many of the boys had taken opportunity to fill their canteens with whiskey. Several of our company were in an interesting condition indeed! And upon the arrival of the train at St. Louis a mutiny broke out among the Irish of Co. B. I narrowly escaped having my skull cracked by the musket of a drunken Hibernian while attempting to aid in quelling the rebellion. We had an exciting time for about two hours and several men were sent to military prison by our officers. We went on board the Str. Bell Memphis and after a delay of some two days cleared for Paducha and Fort Henry. We arrived at this latter place on the 9th. Left the boat the 10th for a camp in the Fort. We remained in camp until the morning of the 12th, when we started for Fort Donelson. We arrived in the vicinity of that place the same day and camped in the woods in close proximity of the enemy's breastworks. On the following morning we commenced our bloody work. We fought for three days as is recorded in the history of the battle — the memorable 13th 14th and 15th of Feb. On Sunday morning the Fort surrendered…"
The Regt of Sharpshooters were ordered out at sundown and stood picket guard all the night of the 3d. In the morning of the 4th heavy cannonading commenced at about four o'clock. We expected a warm time and were not disappointed in our expectations. Skirmishing was kept up during the morning but nothing of the enemy was to be seen except his thin line of skirmishers. About nine o'clock our regiment was deployed as a skirmisher in order to feel the enemy. We advanced about three quarters of a mile beyond our lines of battle and finally succeeded in waking up the enemy. We were unsupported when suddenly the whole woods seemed alive with the enemy. They advanced in heavy columns opening at the same time a tremendous fire of musketry upon us. The sharpshooters were compelled to fall back before this deadly shower of bullets and we did it in good order under [such] fire. Our own batteries also were pouring shot into our own ranks we being in range with them and the enemy. Our company got out without the loss of a man which seemed to me a miracle in consideration of the great number of bullets which were fired at us. Capt. Boyd was shot through the forearm. Lieut. Davison was shot through eh right leg. My own rifle was splintered by a Secesh musket ball, which glanced and hit me in the breast. I escaped wonderfully. Quite a number of our regiment were killed. The rebels advanced rapidly upon our temporary breast works in the face of a tremendous cannonade and a shower of small shots. They seemed perfectly oblivious to the existence of danger and were mowed down like sheep led to slaughter. They took a small fort maned by the 1st Mo Battery and were about turning the guns upon us when we rolled and recaptured it. The rebels gained the town of Corinth once more but were repulsed at last with great slaughter…they certainly fought with determination and courage. We took many prisoners after the Secesh had left. Yesterday will long be remembered by our men. Today a heavy fight is going forward about six miles from here. With what result I can not say. We have taken a large number of prisoners."